New England Kitchen and Bath in Glastonbury, CT provides personalized countertop design and installation services to residents in Enfield, Colchester, Farmington, Avon, Meriden, Cheshire, Glastonbury, Marlborough, Wethersfield, Rocky Hill, Middletown, Durham, and more. Our professional designers will help you select and install your kitchen or bath countertop replacement using experienced knowledge and quality recommendations. We work with you to select the right countertop for your kitchen or bathroom that will not only enhance your remodel, but improve overall functionality and aesthetics. Find a countertop that matches both your preferences and your home's needs, designed and customized by you and installed by our kitchen and bathroom professionals. We offer numerous materials like granite, marble, quartz, Corian, recycled glass, and more that add value and beauty to any room. With plenty of colors and design options like speckled, flamed, and solid appearances; you will definitely find the perfect countertop design to enhance and revive your kitchen or bathroom! When designing your kitchen or bath countertop, it's important to understand the various materials that are available and to know the pros and cons of each one. Every home is unique and different. What works great for one home may not be as good for another. Our experienced design specialists can help you determine which countertop material is best for your needs and budget. 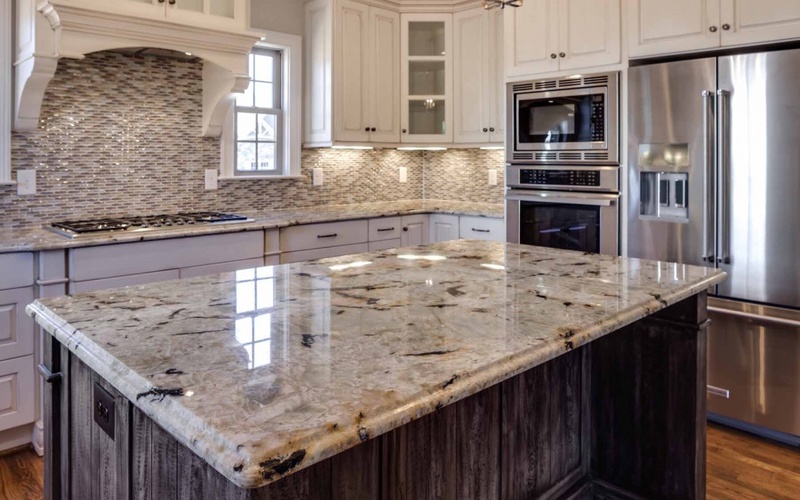 Granite handles heat well and is highly scratch and cut resistant, but it is not naturally water-resistant, which means that you will need to have these countertops professionally sealed every couple of years. Marble is stain resistant and when sealed properly on a routine basis and it also handles heat well. However, it is a more expensive and delicate stone, meaning it can chip and scratch more easily. Quartz countertops are perfect for high traffic use as they offer high durability benefits such as heat, scratch, cut, and chip resistance. They are also on the more inexpensive side. For help selecting the right stone for your kitchen countertops or bathroom vanities, contact our design team today at New England Kitchen and Bath. We’re happy to help you find the perfect match for your remodel. For those of you with a smaller-sized kitchen or bathroom, our designers can help you maximize that space and get the most use from it, without looking crowded while still adding appeal and value to the room.